Then a profile shot of McConaughey walking past a tour bus, cutting down to a shot of him only hip-high, loosely hanging onto a bottle of Wild Turkey. He declares, “We didn’t set out to make a hit,” … and continues to cross the street toward a brick and mortar venue as a classic car passes in front of him, turning right. Then, the capper: McConaughey starts making McConaughey-like gestures with his left hand. The first looks like he’s sliding his hand up as if to say, “we’re good, man.” Then he starts to do little “trumpet fingers.” It’s classic McConaughey, as if it’s still the last day of school in Austin, 1976, and we never left! 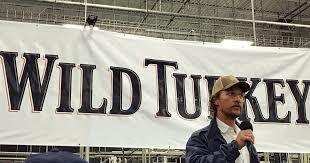 “Wild Turkey,” he concludes in voice over…. “It’ll Find You.” And he continues with the “air fingers.” The End. Well, 3 years after this speech, he seems to be chasing public consumption of bourbon, scraggly facial growth, ogling the ladies, and some interesting “air fingers.” It’s true, the ad is cheesy as hell, glamorizes public consumption and the male gaze, and I highly doubt does much for Wild Turkey. But I just can’t shake the idea that if anyone was meant to get away with this, and can make a bit of a chuckler out of this deep heap of cheese, it’s McConaughey. But does that make it ok? Is the ad harmless, as only McConaughey can make it? Or is this fact an indication that McConaughey is unfairly allowed his own double standard? The detached zany McConaughey being one thing, but isn’t the up-and-down-look he gives that woman something else altogether? Is it fair to view this ad through the same lens as the current issues confronting male behavior, or would trying to paint McConaughey’s rascal behavior here conflate completely different degrees of male bravado / machismo? Is this ad more about freedom and booze and less about being on the prowl? I admittedly find myself of two schools of thought on this, as you can clearly hear me wrestling with it. The ad is everything I’ve pointed out, but does McConaughey as kooky spokesperson with the jazz hands make me laugh? Yes! 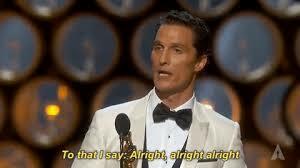 Is there a separate standard allowed Matthew McConaughey? And what, if anything, do we do about it? OR… Do we not only not care, but in fact COUNT ON, McConaughey being McConaughey? Now, before you answer, here’s one little bombshell that may or may not affect your thinking. 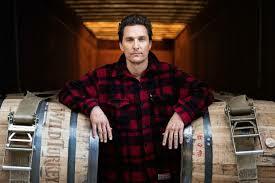 McConaughey isn’t just doing an ad. 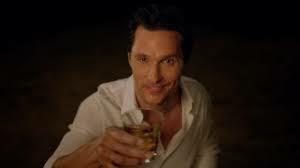 As early as as the summer of 2016, it was announced that the actor had come aboard Wild Turkey as its “Creative Director!” McConaughey and the iconic company announced that he will write, star in, and direct several ads for the Whiskey brand over THE NEXT SEVERAL YEARS. …. I sincerely hope your comments will find me as easily as Wild Turkey — and Matthew McConaughey — will apparently find all of you. I have to say, as a die-hard, blue blooded liberal, this (even for me) is a bit ridiculous. In the ad, the woman clearly looks at him, all the way up and down, and smiles. He turns around, noticing that she’s noticed him, and smiles. Are you suggesting that men should live in a world where they should only stare at the floor, even when a woman clearly shows interest first? With all the *actual* sexual assault that his happening in the world, this is what you dedicate ink space to? Seriously shaking my head. Hi John. Sorry you felt this a waste of your time. But you raise the very question I’m raising. Is any of this even worth the ink space? Or is McConaughy just a lovable goofball who we wouldn’t even think twice about being the flirtatious “party guy?” I even ask if I’m conflating issues. You clearly think so, so your comment is valid. But clearly my question may also be? There are a couple things going on that I cover — this was just one of them. My overall question is does McConaughey get his own special treatment? I’m actually more fascinated by this extension of the McConaughy brand. Not too many celebrities can be defined this way, but he clearly can and he knows it. Lady Gaga is the only other celebrity I know that also serves in a creative director capacity. He also made a short film for Wild Turkey that’s not as cheesy as the commercial, but clearly seeks to define both brands – check it out.